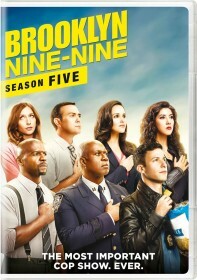 FOX has announced the fifth season premiere of Brooklyn Nine-Nine, "The Big House Pt. 1", which airs Tuesday, September 26 at the new time of 9:30/8:30c. Loui Diamond Phillips (Longmire) and Tim Meadows (The Goldbergs) guest star in the episode. Jake and Rosa assimilate to their new lives behind bars, but both are coping in very different ways. Jake bonds with his cellmate, Caleb (guest star Tim Meadows), and is forced to join a prison gang led by notorious inmate Romero (guest star Lou Diamond Phillips), in order to gain his protection. Meanwhile, in the women's prison, Rosa puts Holt and Terry to the test by having them complete outrageous favors for her. Back in the precinct, Amy and Charles are doing all they can to exonerate their colleagues in the all-new "The Big House Pt.1" Season Five premiere episode of BROOKLYN NINE-NINE airing Tuesday, Sept. 26 (9:30-10:00 PM ET/PT) on FOX.